Home / canadian / Concert / crime / events / Hi FM / local news / MRFC / news / UAE / Lots of local news! Well it's Wednesday already - where did the week go?! There's lots of little bits and pieces I wanted to blog, so I'm going to lump them all into this post because I think it'll be easier. Please do feel free to email me or tweet me bits of news if you would like me to share with everyone. Rising crime in Muscat. You've all read the papers, the letters to the Editor in The Week, and so on. It seems that crime, specifically robberies, are on the rise here in Muscat. And the ROP appear to be struggling a little with this significant up-swing in break-ins. One person who contacted me informed me he had to wait 3 days to get a police report in order to file an insurance claim - surely these things should be issued on the spot by the attending officer? Just this morning, the ROP were called to the Etihad offices in Ruwi for a break-in. Apparently some bright spark thought he could nick himself an A380 or something! So be sure you are vigilant. Ensure your doors and windows are locked, ensure your sliding doors are secured in a way that they can't be easily forced open from the outside, and ensure you do not leave anything of value in display inside your cars. Eid holidays have now been called: a nice cool 3 day haul for the Government, and 4 days for the Private sector. It will be a nice long weekend for sure! I read with interest the letter to the editor published in this weeks The Week about expatriate government employees being discriminated against due to their race. I fully agree with the author of the letter, but we all know nothing will change on that front. 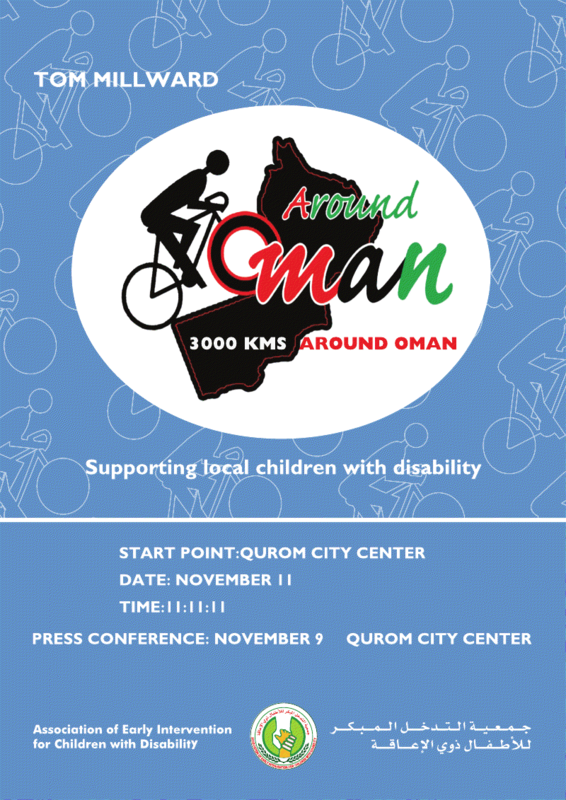 Tomorrow, the 11th November, sees Tom Millward start his ride for charity around Oman. 3000 KM's starting at Qurum City Centre, at 11:11am. Tom is raising money to assist the Association of Early Intervention for Children with Disability in Oman. During his cycle he is also hoping to raise awareness of Oman as a destination for Cycling to the wider community. The cycle ride will take between 2 and 3 months to complete and will cover all sorts of terrain and areas including the difficult and unpredictable interior. If you require further information or would like to donate towards this charity, please contact omanbycycle@hotmail.com or GSM 9761 3342. There are two commemorative coins being minted to mark the 40th anniversary of Oman as we know it today. One is gold, and the other is silver, and will contain the Oman coat of arms and a special 40th anniversary logo - so keep your eyes out for them. It's long been rumoured, and has finally been officially announced: Bryan's coming to town on December the 18th. 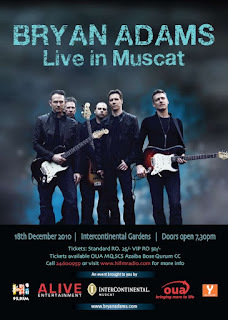 Tickets are RO 25 and are on sale now in all the usual outlets. 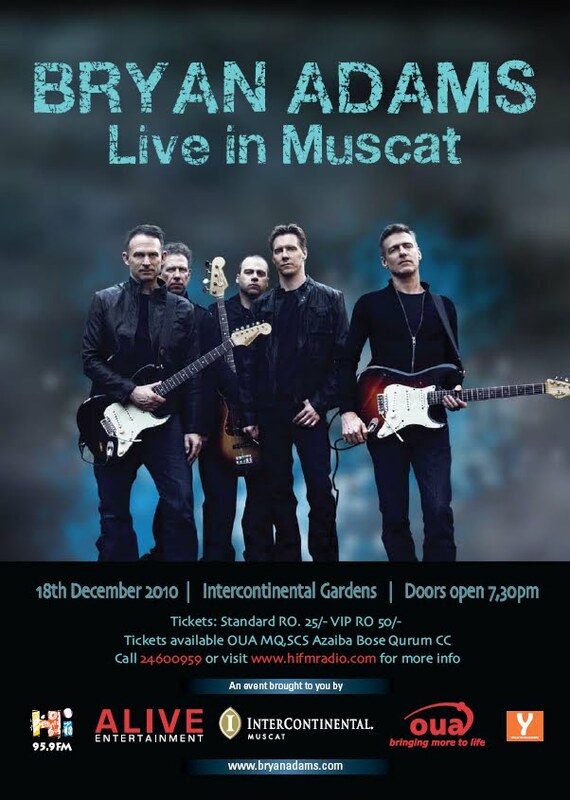 Stay tuned for a free ticket give-away right here on Muscat Mutterings soon. 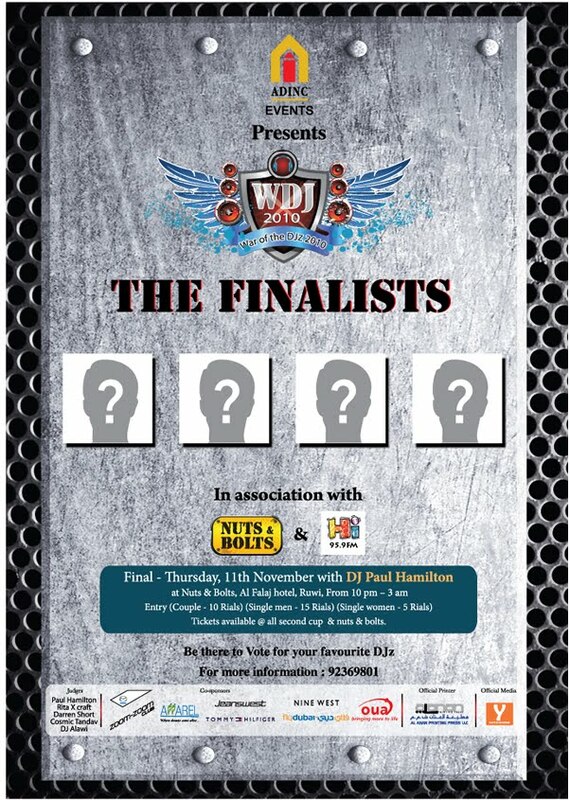 In new nightclub Nuts & Bolts, on Thursday night there is the final of the 2010 War of the Djz competition. 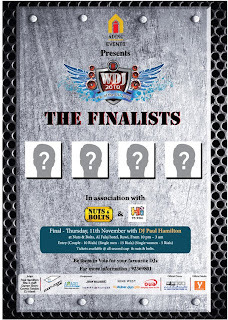 It should be a laugh, so check it out, the finalists are really good at their craft and it will be a great night of musical entertainment! Tonight, the ever-trendy Zouk bar are having their very own VJ (Video Jockey) play some fun videos with crowd interaction, and of course their signature House music pumping all night long. Remember - you pay RO 20 at the door and then you get RO 20 worth of food and drinks inside. This Friday afternoon, from 1:30pm sees an afternoon of fun on the Rugby ground. 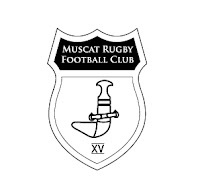 At 1:30 the Muscat Magpies play the Dubai Dingo's, then at 3pm the Muscat Rugby Club's U12 group have a demonstration game, and at 3:30pm we have Muscat RFC Men's Vs the Dubai Exiles. There will be a music system in the stands for spectators, as well as a bbq and drinks (non alcoholic ON the rugby pitch), then down in the clubhouse there are special offers on food and drinks available (including alcohol of course). It will be a fantastic day for everyone, please do come on down and show your support for our local expatriate community. There have been reports that the Royal Opera people have been over-selling events to ensure packed nights, with the slight problem that some people who paid for their tickets do not get to have a seat. Reportedly nearly 30 people were left standing at the Monday night performance. So if you're planning on going to the Opera - make sure you get there early to get a seat! It seems that the on-going spat between the UAE and Canada has gone to the next level: The UAE have now announced that as of January 2nd 2011, all Canadian passport holders visiting the UAE will have to apply for a visa before-hand, and pay the Visa fee (presumably RO 20 a time). One does wonder what the end result of all this diplomatic arguing will be, but it's routed in the fact that the UAE want more than 6 landing slots at Canadian airports each week for it's two airlines (Etihad and Emirates currently have to share the 6 slots). Having personally been on many Etihad flights to Toronto, I can assure you those flights are always jammed full, and more flights would be a good thing. But Air Canada don't want the competition. It would seem that the sound business solution would be to sell more landing slots to the UAE - why is a private company (Air Canada) dictating the Government of Canada's policies on this? That's all for this week - have a fabulous weekend everyone. Nice round up - can't wait to see Bryan Adams myself - I went to see him live at Wembly some while ago now and I am delighted he's coming. Seems to be a lot going on just now - there is also a Magic Show at the Al Bustan later this month and of course the Fireworks competition - lots happening - it's great to be in Oman in the winter. I need 2 tickets. Any way of purchasing them from this end of the country? Susan your tickets will be reserved, do not worry. Bryan Adams!!!!! I'm super excited!! Maybe we should get Bryan to come to SLL. Think he'll just LOVE the climate (and of course also the people) here. To answer your question, because the Canadian government are a load of protectionist muppets. Another manifestation of their idiocy: In order to fly to the US, in many cases it's actually much cheaper to rent a car to cross the border and fly from an American airport than it is to fly from Canada on Air Canada. Yeah who ever heard of a country trying to protect the jobs of it's own citizens and corporations? The Canada and the UAE are acting like a couple of spoiled little kids fighting over their toys in the sandbox. I don't agree with either position. We need more direct flights to the Middle East from Canada. Right now I fly from Vancouver to San Francisco then take the Emirates direct to Dubai. It flys right back over Vancouver. The savings are material compared to Air Canada. I also fly to Dubai once a month from Muscat and spend my hard earned cash there which means employment for someone in the UAE's not so hot economy. If I need to get a visa then I will take my cash somewhere else. No support for either of these kids until they kiss and make up like the repsonible governments they are supposed to be. I suspect that the UAE-Canada spat is due to the fact that Etihad will pick up passengers in Europe to fly on to Canada. On the robberies; I was one of the houses burgled in MQ the other week. All the robberies take place during the morning - a couple of rings on the doorbell and if there is no answer then they'll enter. My robber is now in chains; he was caught in just over a week. Where are the Bryan Adam tickets mate? nice long post Mr Sythe!